The Washburn Review of Jan. 10, 1941, provides additional information. Describing the family’s plans, it states that the family “will stop at Havana and Puerto Limon, and go from there to Cartago, 5,000 feet above sea level, with a climate of perpetual spring.” Referring to Mario Sancho, with whom Dwight was trading jobs, the article notes that Sancho “is a well known writer and teacher in his country. He served as consul at Boston for ten years, was Charge d’Affaires in Mexico for the Costa Rican government. 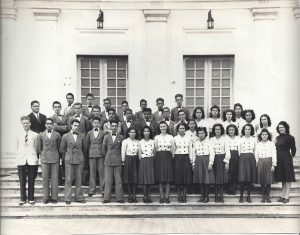 He taught at Brown university and did his graduate work at Harvard university.” According to another newspaper, name unknown, in an article published on Feb. 12, 1941, Mrs. Sancho was an American whom he met during his period as Boston consul. In an interview after returning to the U.S. (Washburn Review, Feb. 6, 1942), Dwight described the Costa Ricans’ enthusiasm for sports. “The Costa Rican president dismissed all of the nation’s schools when an important football game was played there. The football they play is similar to American soccer. Bicycle racing is one of their most highly developed sports.” “I expected to find a country of lush forests with about one person per square mile. Instead it was located on a central plateau high in the mountains with the people in about the expected ratio but crowded into one spot.” Noting that Costa Ricans claim to have a peaceful country, instead, he said, they are “a restless, noisy people who are far from peaceful. Because the towns are built close together after the nature of Spanish towns, you can hear all the noise of the neighbors and of the street. 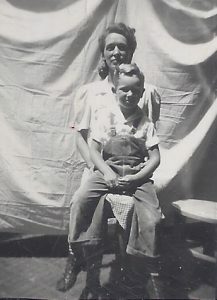 At all hours of night people walk down the streets and, in passing your house, run their canes down the clapboarding.” The Sancho home, where the Bolingers were staying, had the disadvantage of being on the main street close to the bus station. 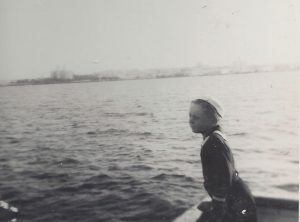 Dwight and Louise’s son Bruce in his sailor suit en route to Costa Rica. Bruce and Louise. 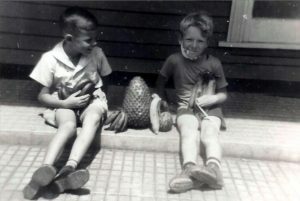 A photo taken probably in Cartago or San Jose, Costa Rica. 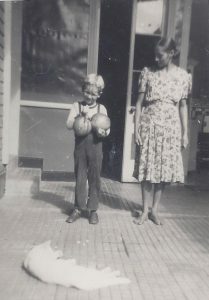 Bruce with Philomena, the maid, and Muñica, the household cat, a fabulous rat-catcher. Once, when Bruce irresponsibly ran out in the street in front of an oncoming bus, Philomena threw herself in front of the bus to stop it. She was OK but Bruce got a good walloping for his behavior. During one of their rambles about the Costa Rican countryside, Dwight and Louise visited a monastery where the monks made and sold beautifully inlaid tables. 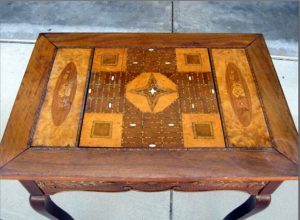 They bought this table but when it came time to return to the U.S., Dwight was fearful that, if they shipped it, it would not arrive intact. His solution was to saw off the legs, carry the table in their luggage, and glue the legs back on after they arrived. The table was designed so that the top could be flipped over revealing a checkerboard. 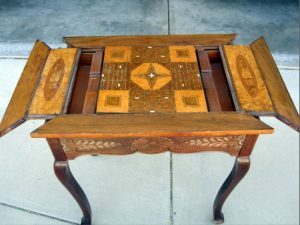 Members of the Bolinger family still have the table all these years later. 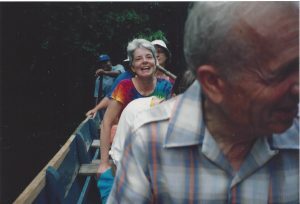 Dwight’s time in Costa Rica was memorable, so much to that in 1987 he, his son Bruce, and daughter-in-law Charlotte paid a visit to the country. It had been 46 years since Dwight was last there. During the visit they were invited to dinner at the home of one of his former students. 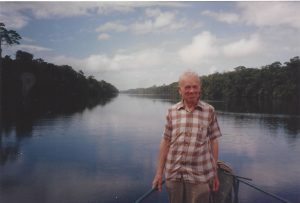 During the time Dwight was teaching at the University of Costa Rica in 1941, he recognized a need at the university for a decent single-volume English-language dictionary. 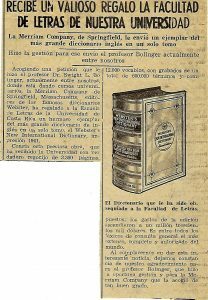 Consequently, he arranged with The Merriam Company of Springfield, Massachusetts to donate a copy of their Webster’s New International Dictionary, published that same year. Containing 3,350 pages, 12,000 words, and 600,000 entries, the donation drew the attention of the local newspaper. Dwight in the foreground on the canal boat, Charlotte in the background. 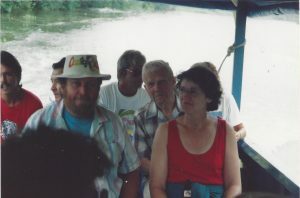 Dwight peers from behind one of the other passengers on the canal boat. 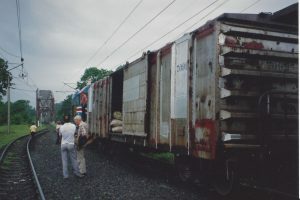 Another memorable part of the 1987 Costa Rican trip was taking the narrow gauge railroad across the country from Limón (where we saw the sloths hanging from the tree limbs in the public park) to San Jose. Here Dwight chats with one of the railway crew during a stop.